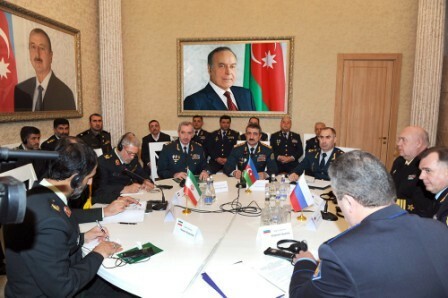 A meeting of the delegations led by chief of the State Border Service (SBS), Colonel General Elchin Guliyev, Deputy Director of the Russian Federation's Federal Security Service, head of the Border Service Vladimir Kulishov and Islamic Republic of Iran Border Guard Commander Qasem Rezaee has been held in Baku. During the meeting, they discussed the situation in the Caspian Sea, the state and prospects of the cooperation on ensuring border security, and work done in combating smuggling, illegal migration, illegal fishing, and expressed readiness to exchange mutual information and experience on the above-mentioned fields. 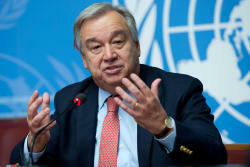 The sides stressed the necessity of holding joint border exercises. They also noted the importance of reciprocal friendship visits of the border guard ships. The participants of the event noted that the cooperation of the border services on combating any illegal activities in the Caspian Sea would contribute to provide border security and stability in the water area of the Caspian Sea and in the region. The meeting participants exchanged views over the expansion of cooperation among border agencies on implementation of measures for solution of the issues arising from implementation of “North-South” international transport corridor project, as well as specifying the areas of activity for the coming years.